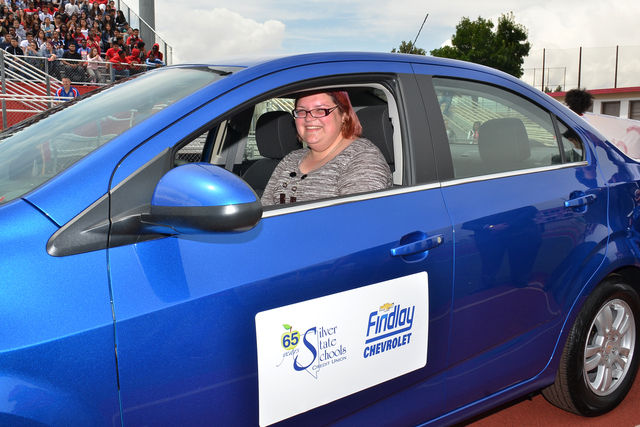 Jamie Tadrzynski’s dedication to the field of education was rewarded May 6 when she was honored as the recipient of a blue 2016 Sonic LT Turbo Sedan compliments of Findlay Chevrolet. The award capped Teacher Appreciation Week. Tadrzynski teaches world history and AP human geography at Valley High School. COURTESY Valley High School teacher Jamie Tadrzynski sits in her 2016 Chevrolet Sonic LT Turbo sedan presented to her May 6, capping Teacher Appreciation Week. The vehicle was donated by Findlay Chevrolet, which has supported the program for three years. COURTESY Findlay Automotive Group combined with prominent Las Vegas business executive Phil Maloof recently to present a donation of $8,350 to the Injured Police Officers Fund. From left, Trooper Jason Buratczuk, Trooper Chelsea Stuenkel, Findlay Automotive Group CFO Tyler Corder and Sergeant Alan Davidson. The Sonic could not have come at a better time because Tadrzynski has been taking public transportation to and from Valley High each day since August. More than 100 educators from throughout the district were nominated by their principals. Two criteria were measured including the teacher’s standing as a high achieving dedicated educator along with needs as it relates to what the teacher used for transportation. Tadrzynski, a fourth-year teacher who moved to Las Vegas last summer, has her own challenges in the first few months in Southern Nevada; she was struck by a vehicle while walking around the city. A dedicated member of the teaching staff at Valley, Tadrzynski also coaches track and field and chaperones several school field trips. The popular Sonic is a bold and sporty vehicle with a 138 horsepower four-cylinder power plant which generates an EPA-estimated 40 mpg on the highway. Equipped with OnStar, it also features Wi-Fi Internet along with 10 standard air bags. The Teacher Appreciation Award marked the third time that Findlay Automotive Group and Findlay Chevrolet have provided a new vehicle to the winner of the event. The event is also sponsored by Silver State Credit Union. Further information regarding Findlay Chevrolet can be found by calling 982-4000 or by visiting www.findlaychevy.com. The dealership headed by General Manager Jamaal McCoy is part of Findlay Automotive Group founded in 1961 by the late Pete Findlay, whose son, Cliff, now oversees 28 automobile dealerships in Nevada, Utah, Arizona, Oregon and Idaho. 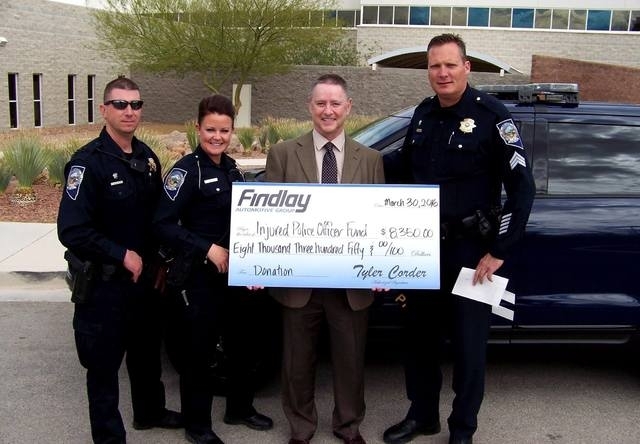 The Injured Police Officers Fund was recently the recipient of a $8,350 donation made possible by Findlay Automotive Group and prominent Las Vegas business executive Phil Maloof. Maloof spun the wheel during Fox 5’s Celebrity Spin Zone before adding to the donation with his own commitment of $5,000 to the IPOF. A specific organization is selected each month as part of the Fox 5 event. The Injured Officers Fund of Nevada’s sole purpose is to provide financial assistance to police officers and their families when an officer is injured or killed in the line of duty. The IPOF covers expenses that have been incurred by an officer while in the line of duty when the expenses are not covered by Workers Compensation policies. The law enforcement agencies in the group include Las Vegas Metro Police Department, North Las Vegas Police Department, Henderson Police Department, Nevada Highway Patrol Southern Region, Boulder City Police Department, Mesquite Police Department, Clark County School District Police Department, UNLV Police Department, Clark County Park Police and the City of Las Vegas Detention and Enforcement. Alan Davidson, a sergeant who has been with the Nevada Highway Patrol for 21 years, said the donation was very generous. Further information regarding the Injured Police Officers Fund can be found by visiting www.ipof.org or www.helplasvegascops.com.